Alan Heuston is a partner in McCann FitzGerald’s tax group, about which Chambers Europe recently noted, ‘They are accessible, technically strong and commercial with their solutions.’ Alan has extensive experience in advising clients on the tax aspects of mergers and acquisitions, reorganisations, restructurings, migrations, capital markets, financial products, banking, and a wide range of other international and domestic tax matters. 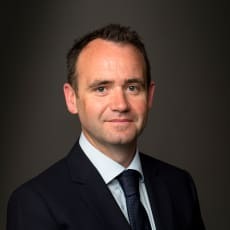 He maintains a particular focus in the area of intellectual property and has advised a wide range of domestic and international clients on the tax aspects of setting up operations in Ireland to exploit and develop intellectual property. Alan leads the firm’s betting and gaming group. Prior to joining McCann FitzGerald, Alan spent a number of years as Director of Tax in Paddy Power Betfair Plc, with responsibility for managing the group’s tax affairs across multiple jurisdictions. As such, he has significant first-hand experience of the regulatory and taxation aspects of the betting and gaming sector. Alan writes and lectures on all topics relating to his practice and is a frequent contributor to client briefings, including recent publications on licensing and advertising issues as they arise in the betting and gaming sector.